You can enjoy any of the 4 seasons in this beautiful custom designed straw bale house with an eye towards 'green and sustainable living'. Custom wood work throughout. Antique reclaimed doors and original art work give this charming home a wonderful sense of character. The now rare but traditional ' mud floors' add to the artistic and quaint charm of Apple Hill Farm. An incredibly gorgeous setting with valley and mountain views will refresh the spirit and soul of all guests large or small, young or old. Stroll the orchard or take a walk to the charming village of Arroyo Seco, a mile away, with shops, boutiques and eateries. Relax in the hot tub while watching our famous sunsets. The open floor plan showing two lofts connected by a wooden bridge walkway adds intrigue and charm and two additional sleeping areas. For added convenience the lofts share an upstairs half bath. 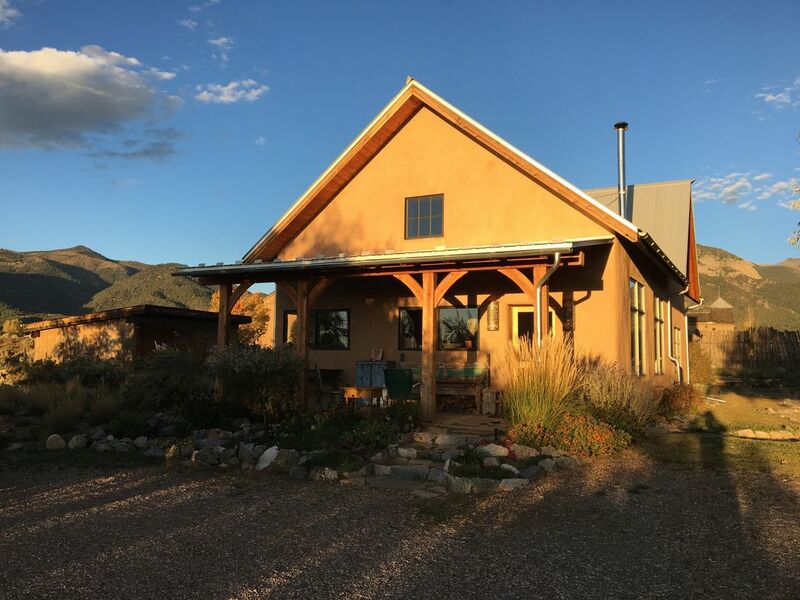 Located half way between Taos and the ski valley, winter guests will enjoy the convenience of the straight drive up to Taos Ski Valley or the easy access route down the mountain and into Taos for dinner or shopping. This is a semi-private setting with 2 other houses sharing 3 acres of fenced land. See our other homes, Casita des Montes, VRBO # 279174, and Casa Manzanita, #650252, right next door to the straw house. Rent two or three for family gatherings or celebrations with friends and we will offer you a special rate. Your caretakers, family friends, will help in any way they can to take care of anything that might come up, or to answer questions about the house or the area. I have been visiting the Taos area since the early '70's. My daughter owns Casita des Montes, #279174, right next door, so I visit often with her and my 3 grandsons. I am a retired Clinical Social Worker and enjoy reading, knitting and cooking up something new for family and friends. Building an energy efficient and 'green' house on my daughter's property was a wonderful addition to the two other homes here. It was important to me that the home take little natural resources from an area that has challenges to it's water supply and that has abundant sunshine. The home's heat in the winter comes mainly from the sun, and it stays cool in summer due to the thickness of the straw bale walls. I visit my home at Apple Hill Farm several times a year. The sunsets here are amazing and I never tire of anticipating each one. I have several close friends in the area and enjoy having them share dinners with me at the straw house. My favorite shops are Wabi Sabi, Common Thread, Twirl Toy Store and Southwest Weaving. Dinner out at Orlando's is always a treat. Large deep tub/shower in master bath with bath salts and bubble bath. With semi-private setting, caretaker on premises. 1 mile walk or drive to Arroyo Seco for ice cream, lunch, dinner, breakfast or shopping. Stunning view of the Sangre de Cristo mountains and west to the Cerro Pedernal, Georgia O'keefe's beloved mountain. A ceiling fan in the upstairs loft room supplies cooling air movement to the whole house. Thick straw bale walls offer protection from the summer sun. Cross ventilation from all directions and our cool mountain nights give you a comfortable sleeping environment. Hot water radiant heat in floors, passive solar gain from south facing windows. Wood stove supplements heat. Guests must be willing to use wood stove. We ask that you don't adjust the thermostats. Plant based laundry detergent supplied. Plant based dryer sheets supplied. Outside dryer line for air drying. Wood provided. Guests must be willing to use wood stove to take chill off house. Seating is arranged around wood stove. Full size natural gas, with full set of cooking and baking pans. Coffee beans, sugar, flour, butter, honey, mustard, mayo, ketchup. Combined dining, kitchen and living areas for family gathering. Table seats 7. TV flat screen upstairs in 'media room' in the loft bedroom with the futon couch. Huge library of DVD's for adults and children. Art, fiction, non fiction, and books for kids. (2) Covered patios for watching sunrise and sunset, plus one shaded north facing. With mountain and sunset views. Children under 5 not allowed in the tub. This house in wonderful. The little town of Arroyo Seco is quirky and cool, the views from the house are amazing, the house itself was extremely comfortable and had a great energy about it. We did not want to leave! Thank you so much for your kind words! We are so happy that you enjoyed our house and the sweet village of Arroyo Seco. It truly is a magical part of the world. Please come again! You are welcome anytime, and we'd love to have you back. The view was stellar! We had everything we needed during our stay and the hot tub put this stay over the top! We enjoyed our stay here. It sleeps 5 easily. It has most all the amenities you expect except for maybe a dishwasher. The hot tub was a nice bonus after a day of skiing. I would stay here again. Was a great experience. I would welcome more privacy on the lower floor main living area. No shades or anyway to have privacy. The shower setup I still can’t understand from a practicality standpoint and as a builder. The difficulty in using a shower was quite frustrating. A lot more thought went into the instructions then just changing the plumbing setup. Seems to be an afterthought at build, still a roomy and well stocked little place. We loved the cabin and the firewood was plentiful. Once again, Apple Hill Farm didn't disappoint. We had a lovely stay in the quiet straw-bale and had no problems with the rental. Beds are comfortable, kitchen is beautifully equipped. Even at this time of year, the desert gardens are enjoyable for spending time wandering and wondering about. We have only one (very minor) comment: the living room lighting in the evening is very dim, there is only one chair with sufficient light to read by. We think the living room lighting would be improved if a lamp were placed near the chair by the entry door. This is a minor complaint, really. We made do by visiting with one another rather than reading. How quaint! We enjoyed every minute of our stay and are already looking forward to our next visit. Thank you for a wonderful home away from home. This was my 3rd stay at Apple Hill Farm. It always exceeds my expectations. $20 per person per night for over 5 people. Rates are subject to change until booking is confirmed. No dogs, but open to talking with you about your pet. 1 dog may be allowed if crate trained. Dogs that are heavy shedders are not allowed due to antique rugs. Absolutely no pets on furniture.